When using the Profit Rhino mobile build, you may have stumbled upon our option board section. 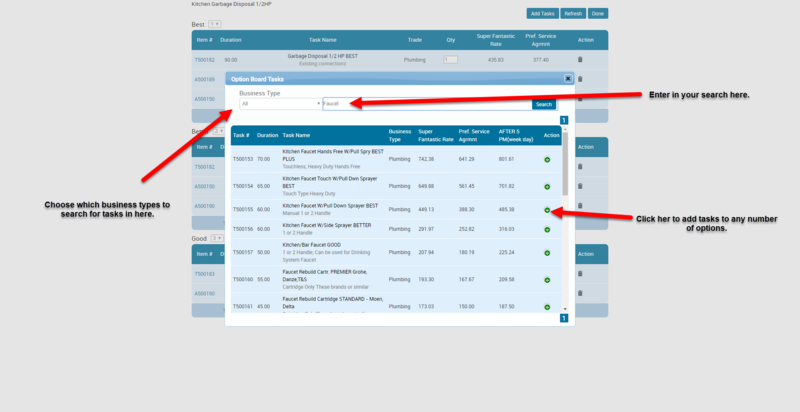 Option boards allow you to have a set up of different quotes to give your customers pre-made when you show up on the call. This will help technicians cut down on time for jobs that are generally going to be the same through and through. Most people use option boards to offer a "Good/Better/Best" option layout. Where you show your customers what would be a critical fix, what would be a moderate fix, and what would be the optimal fix for the long term. 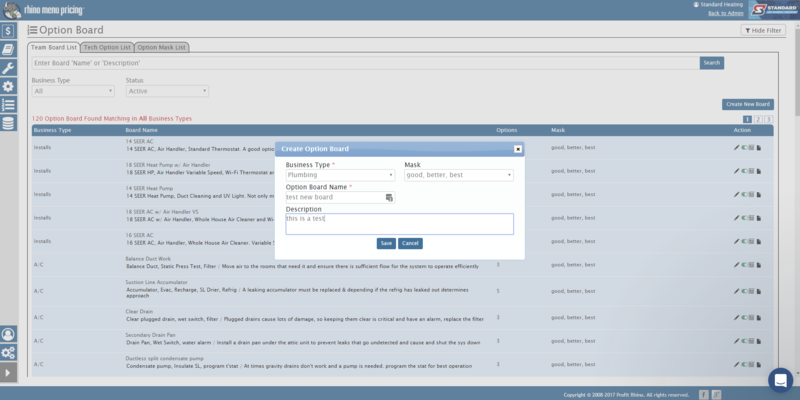 In this article I'll be showing you how to rename option boards and how to edit their contents. Ok, so, this looks like a lot take in, but it's actually very basic. You can change the name of an option board, which option mask it's using, which business type it's in, and the description it has attached to it. If you've ever created an option board, you should be familiar with all of these fields, and the best way to set them up according to your needs. After you've done that, click save, and we'll go over how to edit the contents of an option board. As the image above shows, clicking that little icon will open a pop-up window with all of your options and tasks already in them. (Obviously, this is only for the option board you're choosing to edit, not the options and tasks for every single option board). 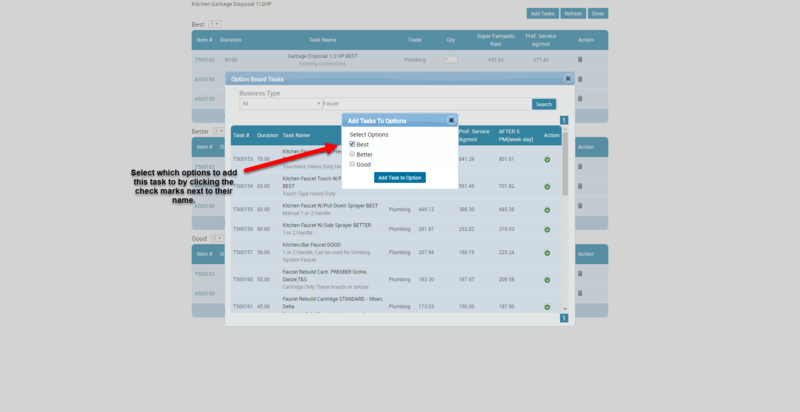 Click the task number of any task to edit that task if you need to make a quick adjust. Delete any task from an option board by clicking the trash can. Swap the position of any two options. 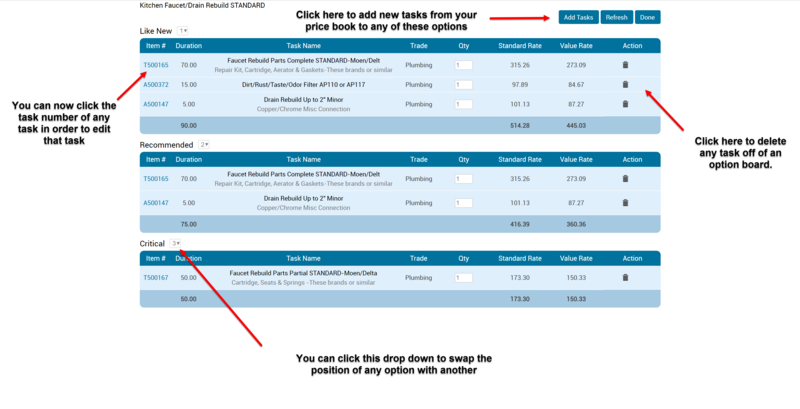 Click the "Add Tasks" button to add any tasks from your price book to this option board. Select which options you'd like to add this particular task to, and then click [Add Task to Option] and there you have it. You've edited the contents of your option boards. From this point, you can add, delete, or rename whatever else you'd like to in your option builder section.